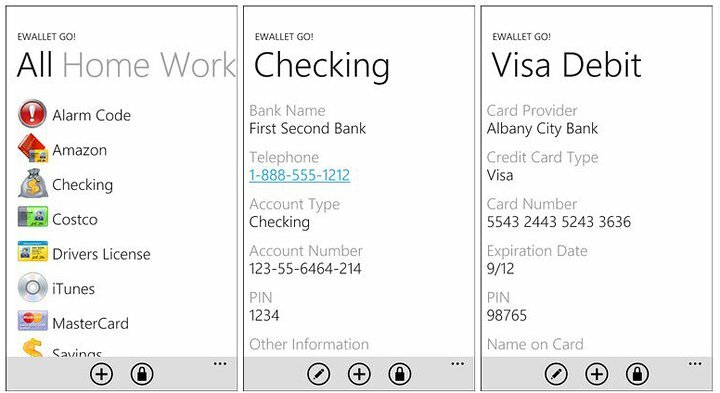 We've taken a look at Password Manager for the Windows Phone and now we'll shine the spotlight on eWallet GO. Ilium Software is offering the Windows Phone app over at the Marketplace to help you keep track of your usernames/passwords, financial accounts, credit cards, PIN Numbers and other information that needs to be secure but readily available. eWallet GO makes it easy to get started, with 29 ready-to-use templates for you to enter all your critical information. The app supports multiple categories, so you'll never have to second guess where you saved any of your information. eWallet Go's philosophy, "It's your info - save it however you like, and access it fast without worry." eWallet GO also supports Google Docs or Dropbox to help make saving your file easily. Not only can you back up and restore your wallet to your phone, but if you also purchase eWallet GO! for Windows (available from Ilium's website) you can back up and restore between your phone and your PC. There isn't a trial version for eWallet Go and the full version is running $4.99. You can download it here (opens Zune) at the Marketplace.